One of 5 visits to an orthopedic practice is for cervical discogenic pain (CDP), with C5-6 and C6-7 accounting for approximately 75% of visits. C7 is the most common nerve root involved. Cervical discogenic pain syndrome (CDPS) presents with proximal symptoms first, and, later, it can progress to brachialgia. For excellent patient education resources, visit eMedicineHealth's First Aid and Injuries Center. Also, see eMedicineHealth's patient education articles Shoulder and Neck Pain and Neck Strain. Cervical intervertebral disc disease accounts for 36% of all spinal intervertebral disc disease. This condition is somewhat more common in women. Although acute attacks may start at a very young age with episodes of acute torticollis or "wry neck," the incidence peaks when persons are aged 45-50 years (see image below). Appearance of torticollis as a result of sternomastoid fibrosis in a young child. Of all sports-related injuries, 2-3% are spinal injuries and the majority of these happened during unsupervised activities such as football, soccer, wrestling, diving, surfing, skiing and sandlot games. The majority of the available literature, however, is found for football and this group is the most likely to sustain cervical trauma. The cervical spine permits a wide range of motion (ROM) of the head in relation to the trunk. A degree of stability and flexibility is required to control the motion and dissipate the forces applied to the spine. Great differences in anatomy and function exist between the occiput-C1, the C1-2 (upper complex), and C3-C7 (lower complex) levels. Eight motion segments occur between the occiput and T1. No disc exists between C1 and C2; therefore, the first intervertebral disc is between C2 and C3. The adult cervical disc has a crescentic shape anteriorly, with the apex of the crescent at the uncovertebral joints on each side. The posterior annulus has multiple vertical fissures allowing for a very degenerative appearance during discography and on gross examination. In addition, the nucleus of the cervical disc tends to be poorly centralized when compared with the lumbar disc. In the lumbar disc, the nucleus tends to be well localized in the center of the disc, and the posterior annulus tends to remain relatively intact when compared with the cervical disc. Annular fissures in the lumbar disc tend to be circumferential and/or radial in nature. Biomechanics is the study of the changes in the anatomic structures occurring during body movements. The movements of the cervical spine include flexion and extension in the sagittal plane, lateral flexion in the coronal plane, and rotation in the horizontal plane. Lateral flexion and rotation occur as coupled movements. Other movements of the cervical spine include protrusion (ie, the head is moved as far forward as possible with the neck outstretched and maintaining forward-facing position) and retraction (ie, the head is moved as far backward as possible and maintaining a forward-facing position). Fifty percent of rotation of the cervical spine occurs in the upper cervical complex with the atlas rotating ipsilaterally around the odontoid. Protrusion causes upper cervical spine extension and lower cervical spine flexion, whereas retraction causes upper cervical spine flexion and lower cervical spine extension. At the occiput-C1 and C1-2 levels, ROM is greater with the protruded and retracted position than with full-length flexion and full-length extension positions. See the image below. 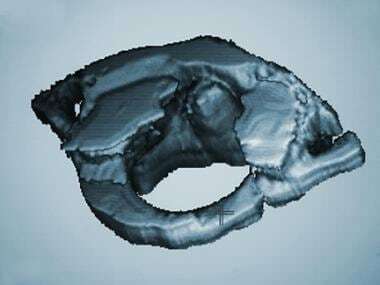 Three-dimensional computed tomography scan of C1. The annular fibers are made up of collagenous lamellae with alternating directions of inclination oriented 35° from the horizontal. The annulus is more susceptible to injury with rotation and translation movements due to resistance offered only by the lamella oriented in the direction of movement. In the cervical spine, as in the lumbar spine, the intervertebral disc dissipates the transmission of compressive loads throughout the ROM by slowing the rate at which these forces are transmitted through the spine. By diverting the load via temporarily stretching the annular fibers, the disc protects the vertebra from taking the entire load at once. 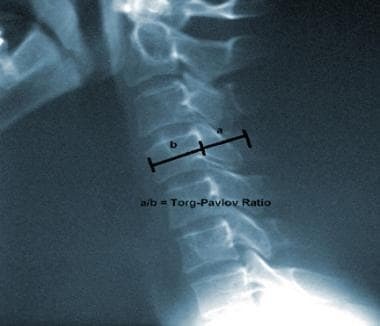 Lateral cervical spine plain radiograph illustrating the Torg/Pavlov ratio. Type I injuries were those that caused permanent spinal cord damage, including conditions such as anterior cord syndrome, Brown-Sequard syndrome, central cord syndrome, and mixed incomplete syndrome. Type II injuries were classified as those that occur transiently after athletic trauma with normal neurologic examination and normal radiologic evaluation. Type II injuries included spinal concussion neurapraxia, and "burning hands" syndrome. The burning hands syndrome was described as suspected injury to the spinothalamic and corticospinal tracts, resulting in arm and hand weakness with burning dysesthesias. This is distinct from the burner or stinger injury that is a common cervical injury in football players and is thought to be due to traction on the upper trunk of the brachial plexus. In this condition, athletes typically have a burning, dysesthetic pain that begins in the shoulder region and radiates unilaterally into the arm and hand, with C5-C6 distribution numbness or weakness. Type III injuries were classified in athletes with only radiologic abnormalities but without neurologic deficit. These included congenital spinal stenosis, acquired spinal stenosis, herniated cervical disc, an unstable fracture, fracture/dislocation, ligamentous injury, and spear-tackler’s spine. Spear tackler’s spine was described by Torg et al described athletes that were at high risk for quadriplegic injury. These athletes had developmental cervical canal stenosis, reversal of the cervical lordosis, preexisting posttraumatic cervical radiographic abnormalities, and documentation of using spear-tackling techniques. Hult L. Cervical, dorsal and lumbar spinal syndromes; a field investigation of a non-selected material of 1200 workers in different occupations with special reference to disc degeneration and so-called muscular rheumatism. Acta Orthop Scand Suppl. 1954. 17:1-102. [Medline]. McKenzie RA. The Cervical and Thoracic Spine. Mechanical Diagnosis and Therapy. Wakainae, New Zealand: Spinal Publications; 1990. Kramer J. Intervertebral Disk Diseases. Causes, Diagnosis, Treatment and Prophylaxis. George Thieme Verlag, Stuttgart Year Book, Medical Publishers Inc; 1981. Bailes JE, Maroon JC. Management of cervical spine injuries in athletes. Clin Sports Med. 1989 Jan. 8(1):43-58. [Medline]. Maroon JC, Steele PB, Berlin R. Football head and neck injuries--an update. Clin Neurosurg. 1980. 27:414-29. [Medline]. Cantu RC. The cervical spinal stenosis controversy. Clin Sports Med. 1998 Jan. 17(1):121-6. [Medline]. Morganti C. Recommendations for return to sports following cervical spine injuries. Sports Med. 2003. 33(8):563-73. [Medline]. Bagduk N, Twomey LT. Clinical Anatomy of the Lumbar Spine. 2nd ed. New York, NY: Churchill Livingston; 1991. Bogduk N, Tynan W, Wilson AS. The nerve supply to the human lumbar intervertebral discs. J Anat. 1981 Jan. 132:39-56. [Medline]. Bogduk N, Windsor M, Inglis A. The innervation of the cervical intervertebral discs. Spine. 1988 Jan. 13(1):2-8. [Medline]. Malinsky J. The ontogenetic development of nerve terminations in the intervertebral discs of man. (Histology of intervertebral discs, 11th communication). Acta Anat (Basel). 1959. 38:96-113. [Medline]. Mendel T, Wink CS, Zimny ML. Neural elements in human cervical intervertebral discs. Spine. 1992 Feb. 17(2):132-5. [Medline]. Panjabi MM, Vasavada A, White AA III. Cervical spine biomechanics. Semin Spine Surg. 1993. 5:10-6. Ordway NR, Seymour RJ, Donelson RG, Hojnowski LS, Edwards WT. Cervical flexion, extension, protrusion, and retraction. A radiographic segmental analysis. Spine. 1999 Feb 1. 24(3):240-7. [Medline]. Ellenberg MR, Honet JC, Treanor WJ. Cervical radiculopathy. Arch Phys Med Rehabil. 1994 Mar. 75(3):342-52. [Medline]. White AA, Panjabi MM. Clinical Biomechanics of the Spine. 2nd ed. Philadelphia, Pa: JB Lippincott; 1991. 85-125. Maroon JC. Burning hands' in football spinal cord injuries. JAMA. 1977 Nov 7. 238(19):2049-51. [Medline]. Lavin RA, Pappagallo M, Kuhlemeier KV. Cervical pain: a comparison of three pillows. Arch Phys Med Rehabil. 1997 Feb. 78(2):193-8. [Medline]. CLOWARD RB. Cervical diskography. A contribution to the etiology and mechanism of neck, shoulder and arm pain. Ann Surg. 1959 Dec. 150:1052-64. [Medline]. [Full Text]. Deyo RA, Diehl AK. Cancer as a cause of back pain: frequency, clinical presentation, and diagnostic strategies. J Gen Intern Med. 1988 May-Jun. 3(3):230-8. [Medline]. Deyo RA, Rainville J, Kent DL. What can the history and physical examination tell us about low back pain?. JAMA. 1992 Aug 12. 268(6):760-5. [Medline]. Yoss RE, Corbin KB, MacCarty CS, Love JG. Significance of symptoms and signs in localization of involved root in cervical disk protrusion. Neurology. 1957 Oct. 7(10):673-83. [Medline]. Beatty RM, Fowler FD, Hanson EJ Jr. The abducted arm as a sign of ruptured cervical disc. Neurosurgery. 1987 Nov. 21(5):731-2. [Medline]. Viikari-Juntura E, Porras M, Laasonen EM. Validity of clinical tests in the diagnosis of root compression in cervical disc disease. Spine. 1989 Mar. 14(3):253-7. [Medline]. Gumina S, Carbone S, Albino P, Gurzi M, Postacchini F. Arm Squeeze Test: a new clinical test to distinguish neck from shoulder pain. Eur Spine J. 2013 Jul. 22(7):1558-63. [Medline]. [Full Text]. Twomey L, Taylor J. Flexion creep deformation and hysteresis in the lumbar vertebral column. Spine. 1982 Mar-Apr. 7(2):116-22. [Medline]. Handa T, Ishihara H, Ohshima H, et al. Effects of hydrostatic pressure on matrix synthesis and matrix metalloproteinase production in the human lumbar intervertebral disc. Spine. 1997 May 15. 22(10):1085-91. [Medline]. Coventry MB, Ghormley RK, Kernohan JW. The intervertebral disc. Its microscopic anatomy and pathology. Part III. Pathological changes in the intervertebral disc. J Bone Joint Surg. 1945. 27:460-74. [Full Text]. Gower WE, Pedrini V. Age-related variations in proteinpolysaccharides from human nucleus pulposus, annulus fibrosus, and costal cartilage. J Bone Joint Surg Am. 1969 Sep. 51(6):1154-62. [Medline]. [Full Text]. Lipson SJ, Muir H. Experimental intervertebral disc degeneration: morphologic and proteoglycan changes over time. Arthritis Rheum. 1981 Jan. 24(1):12-21. [Medline]. Pearce RH, Grimmer BJ, Adams ME. Degeneration and the chemical composition of the human lumbar intervertebral disc. J Orthop Res. 1987. 5(2):198-205. [Medline]. Harms-Ringdahl K. On assessment of shoulder exercise and load-elicited pain in the cervical spine. Biomechanical analysis of load--EMG--methodological studies of pain provoked by extreme position. Scand J Rehabil Med Suppl. 1986. 14:1-40. [Medline]. Gore DR, Sepic SB, Gardner GM. Roentgenographic findings of the cervical spine in asymptomatic people. Spine. 1986 Jul-Aug. 11(6):521-4. [Medline]. Yu SW, Sether LA, Ho PS, Wagner M, Haughton VM. Tears of the anulus fibrosus: correlation between MR and pathologic findings in cadavers. AJNR Am J Neuroradiol. 1988 Mar-Apr. 9(2):367-70. [Medline]. Karnaze MG, Gado MH, Sartor KJ, Hodges FJ 3rd. Comparison of MR and CT myelography in imaging the cervical and thoracic spine. AJR Am J Roentgenol. 1988 Feb. 150(2):397-403. [Medline]. [Full Text]. Modic MT, Masaryk TJ, Mulopulos GP, et al. Cervical radiculopathy: prospective evaluation with surface coil MR imaging, CT with metrizamide, and metrizamide myelography. Radiology. 1986 Dec. 161(3):753-9. [Medline]. [Full Text]. Kramer J, Rivera CA, Kleefield J. Degenerative disorders of the cervical spine. Rheum Dis Clin North Am. 1991 Aug. 17(3):741-55. [Medline]. Schellhas KP, Smith MD, Gundry CR, Pollei SR. Cervical discogenic pain. Prospective correlation of magnetic resonance imaging and discography in asymptomatic subjects and pain sufferers. Spine. 1996 Feb 1. 21(3):300-11; discussion 311-2. [Medline]. Matsumoto M, Fujimura Y, Suzuki N, et al. MRI of cervical intervertebral discs in asymptomatic subjects. J Bone Joint Surg Br. 1998 Jan. 80(1):19-24. [Medline]. [Full Text]. Parfenchuck TA, Janssen ME. A correlation of cervical magnetic resonance imaging and discography/computed tomographic discograms. Spine. 1994 Dec 15. 19(24):2819-25. [Medline]. Manchikanti L, Dunbar EE, Wargo BW, et al. Systematic review of cervical discography as a diagnostic test for chronic spinal pain. Pain Physician. 2009 Mar-Apr. 12(2):305-21. [Medline]. [Full Text]. Siebenrock KA, Aebi M. [The value of diskography in disk-related pain syndrome of the cervical spine for evaluation of indications for spondylodesis] [German]. Z Orthop Ihre Grenzgeb. 1993 May Jun. 131(3):220-4. [Medline]. Osler GE. Cervical analgesic discography. A test for diagnosis of the painful disc syndrome. S Afr Med J. 1987 Mar 21. 71(6):363. [Medline]. Roth DA. Cervical analgesic discography. A new test for the definitive diagnosis of the painful-disk syndrome. JAMA. 1976 Apr 19. 235(16):1713-4. [Medline]. Wilbourn AJ, Aminoff MJ. AAEE minimonograph #32: the electrophysiologic examination in patients with radiculopathies. Muscle Nerve. 1988 Nov. 11(11):1099-114. [Medline]. Dvorak J. Epidemiology, physical examination, and neurodiagnostics. Spine. 1998 Dec 15. 23(24):2663-73. [Medline]. Gangi A, Tsoumakidou G, Buy X, Cabral JF, Garnon J. Percutaneous techniques for cervical pain of discal origin. Semin Musculoskelet Radiol. 2011 Apr. 15(2):172-80. [Medline]. [Guideline] Manchikanti L, Abdi S, Atluri S, Benyamin RM, Boswell MV, Buenaventura RM, et al. An Update of Comprehensive Evidence-Based Guidelines for Interventional Techniques in Chronic Spinal Pain. Part II: Guidance and Recommendations. Pain Physician. 2013 Apr. 16(2 Suppl):S49-S283. [Medline]. Donelson R, Aprill C, Medcalf R, Grant W. A prospective study of centralization of lumbar and referred pain. A predictor of symptomatic discs and anular competence. Spine. 1997 May 15. 22(10):1115-22. [Medline]. Donelson R, McKenzie R. Mechanical assessment and treatment of spinal pain. Frymoyer JW, ed. The Adult Spine: Principles and Practice. 2nd ed. New York, NY: Lippincott-Raven Publishers; 1997. 1821-35. Donelson R, Silva G, Murphy K. Centralization phenomenon. Its usefulness in evaluating and treating referred pain. Spine. 1990 Mar. 15(3):211-3. [Medline]. Benini A, Krayenbuhl H, Bruderl R. Anterior cervical discectomy without fusion. Microsurgical technique. Acta Neurochir (Wien). 1982. 61(1-3):105-10. [Medline]. Martins AN. Anterior cervical discectomy with and without interbody bone graft. J Neurosurg. 1976 Mar. 44(3):290-5. [Medline]. Palit M, Schofferman J, Goldthwaite N, et al. Anterior discectomy and fusion for the management of neck pain. Spine. 1999 Nov 1. 24(21):2224-8. [Medline]. Yamamoto I, Ikeda A, Shibuya N, Tsugane R, Sato O. Clinical long-term results of anterior discectomy without interbody fusion for cervical disc disease. Spine. 1991 Mar. 16(3):272-9. [Medline]. Green PW. Anterior cervical fusion. A review of thirty-three patients with cervical disc degeneration. J Bone Joint Surg Br. 1977 May. 59(2):236-40. [Medline]. [Full Text]. Heller JG, Schimandle JH. Operative treatment of degenerative cervical disk disease. J South Orthop Assoc. 1996 Fall. 5(3):188-206. [Medline]. Bush K, Hillier S. Outcome of cervical radiculopathy treated with periradicular/epidural corticosteroid injections: a prospective study with independent clinical review. Eur Spine J. 1996. 5(5):319-25. [Medline]. Honet JC, Puri K. Cervical radiculitis: treatment and results in 82 patients. Arch Phys Med Rehabil. 1976 Jan. 57(1):12-6. [Medline]. Rubin D. Cervical radiculitis: diagnosis and treatment. Arch Phys Med Rehabil. 1960 Dec. 41:580-6. [Medline]. Saal JS, Saal JA, Yurth EF. Nonoperative management of herniated cervical intervertebral disc with radiculopathy. Spine. 1996 Aug 15. 21(16):1877-83. [Medline]. Bush K, Chaudhuri R, Hillier S, Penny J. The pathomorphologic changes that accompany the resolution of cervical radiculopathy. A prospective study with repeat magnetic resonance imaging. Spine. 1997 Jan 15. 22(2):183-6; discussion 187. [Medline]. Maigne JY, Deligne L. Computed tomographic follow-up study of 21 cases of nonoperatively treated cervical intervertebral soft disc herniation. Spine. 1994 Jan 15. 19(2):189-91. [Medline]. Mochida K, Komori H, Okawa A, et al. Regression of cervical disc herniation observed on magnetic resonance images. Spine. 1998 May 1. 23(9):990-5; discussion 996-7. [Medline]. Schulman J. Treatment of neck pain with cervical epidural steroid injection. Reg Anesth. 1986. 11:92-94. Diwan S, Manchikanti L, Benyamin RM, Bryce DA, Geffert S, Hameed H, et al. Effectiveness of cervical epidural injections in the management of chronic neck and upper extremity pain. Pain Physician. 2012 Jul-Aug. 15(4):E405-34. [Medline]. Manchikanti L, Nampiaparampil DE, Candido KD, Bakshi S, Grider JS, Falco FJ, et al. Do cervical epidural injections provide long-term relief in neck and upper extremity pain? A systematic review. Pain Physician. 2015 Jan-Feb. 18 (1):39-60. [Medline]. Slipman CW, Lipetz JS, Jackson HB, Rogers DP, Vresilovic EJ. Therapeutic selective nerve root block in the nonsurgical treatment of atraumatic cervical spondylotic radicular pain: a retrospective analysis with independent clinical review. Arch Phys Med Rehabil. 2000 Jun. 81(6):741-6. [Medline]. Boswell MV, Trescot AM, Datta S, et al, for the American Society of Interventional Pain Physicians. Interventional techniques: evidence-based practice guidelines in the management of chronic spinal pain. Pain Physician. 2007 Jan. 10(1):7-111. [Medline]. [Full Text]. Cantu RC, Mueller FO. Catastrophic spine injuries in football (1977-1989). J Spinal Disord. 1990 Sep. 3(3):227-31. [Medline]. Cloward RB. Acute cervical spine injuries. Clin Symp. 1980. 32(1):1-32. [Medline]. Delgado-Lo Pez PD, Rodri Guez-Salazar A, Castilla-Di Ez JM, et al. [Role of surgery in spinal degenerative disease. Analysis of systematic reviews on surgical and conservative treatments from an evidence-based approach] [Spanish]. Neurocirugia (Astur). 2005 Apr. 16(2):142-57. [Medline]. [Full Text]. Haines T, Gross A, Goldsmith CH, Perry L. Patient education for neck pain with or without radiculopathy. Cochrane Database Syst Rev. 2008 Oct 8. CD005106. [Medline]. Heiskari M. Comparative retrospective study of patients operated for cervical disc herniation and spondylosis. Ann Clin Res. 1986. 18 suppl 47:57-63. [Medline]. Kramer J. Intervertebral Disk Diseases: Causes, Diagnosis, Treatment and Prophylaxis. New York, NY: Thieme Medical Publishers; 1990. LaPrade RF, Burnett QM, Zarzour R, Moss R. The effect of the mandatory use of face masks on facial lacerations and head and neck injuries in ice hockey. A prospective study. Am J Sports Med. 1995 Nov-Dec. 23(6):773-5. [Medline]. Levin JH. Prospective, double-blind, randomized placebo-controlled trials in interventional spine: what the highest quality literature tells us. Spine J. 2008 Sep 11. epub ahead of print. [Medline]. Majors R. Degenerative and morphological changes of the cervical spine in professional soccer players. Presented at: Annual meeting of the American Orthopaedic Society for Sports Medicine. Sun Valley, Idaho: 1997. Odom GL, Finney W, Woodhall B. Cervical disk lesions. J Am Med Assoc. 1958 Jan 4. 166(1):23-8. [Medline]. Schmidek HH. Cervical spondylosis. Am Fam Physician. 1986 May. 33(5):89-99. [Medline]. Tator C. Injuries to the cervical spine and spinal cord resulting from ice hockey. Torg JS, ed. Athletic Injuries to the Head, Neck and Face. 2nd ed. St Louis, Mo: Mosby-Year Book; 1991. 124-32. Tator CH, Carson JD, Edmonds VE. New spinal injuries in hockey. Clin J Sport Med. 1997 Jan. 7(1):17-21. [Medline]. Taylor KF, Coolican MR. Spinal cord injuries in football-rugby union, rugby league and Australian rules. Torg JS, ed. Athletic Injuries in Head, Neck and Face. 2nd ed. St Louis, Mo: Mosby-Year Book; 1991. 174-97. Torg JS, ed. Injuries to the cervical spine and spinal cord resulting from water sports. Athletic Injuries in Head, Neck and Face. 2nd ed. St Louis, Mo: Mosby-Year Book; 1991. 157-73. Wu WQ, Lewis RC. Injuries of the cervical spine in high school wrestling. Surg Neurol. 1985 Feb. 23(2):143-7. [Medline]. Axial computed tomography scan of cervical herniated nucleus pulposus. T1-weighted magnetic resonance image of a cervical disk herniation. T2-weighted magnetic resonance image of a cervical disk herniation. Myelogram of cervical herniated disk. A filling defect is shown. Lateral view of a C2 fracture dislocation.